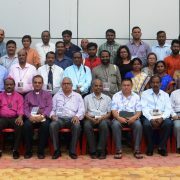 A programme on Interfaith Dialogue on Child Labour and Child Rights was jointly organised by United Evangelical Lutheran Churches in India (UELC) Conflict Transformation and Peace-building Programme and the National Council of Churches in India (NCCI) Commission on Justice, Peace and Creation recently at the NCCI Campus, Nagpur, on the occasion of International Day against Child labour. The Programme was chaired by the National Secretary of All India Progressive Forum, Dr. Yugal J. Rayalu, while Dr. Roger Gaikwad, General Secretary NCCI, gave the keynote address. 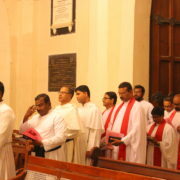 Mr. Samuel Logan from United Evangelical Lutheran Churches in India, was present on the dais. At the beginning of the programme, Mr. Samuel Logan, welcomed all the speakers and the dignitaries present in the programme. He told the gathering that the main aim of this programme was to develop a platform where people of different faith can come together and work towards the rights of Children. In his Key Note, Rev. Dr. Roger Gaikwad said that the welfare of children concerns all of us, including the NCCI. 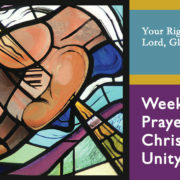 It’s focus on poverty, justice and liberation theology involved concern for children. 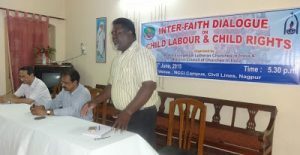 Its engagement with Feminist theology also addressed the plight of girl child, Dalit Theology also included concerns about Dalit children, and so till date, for different Commissions and Ministries of NCCI, children are still an important part of NCCI. As challenges for children are increasing, it is important for us to learn from one another how religions address the issue of child rights and child labour. Opening the discussion, Advocate P.K. Sathianatham, Public Persecutor and social activist, spoke from the legal perspective on how the Juvenile Justice Act looks at children. He brought to notice through various instances on how Juvenile laws have undergone changes and have evolved in the past years keeping in mind the concerns for the children who were victims of sexual abuse, marital conflicts and so forth. In connection to this, he highlighted the new law for children on Protection of Children from Sexual Act 2012 which enforces change of procedure and use of sensitive words during proceedings with the children. He suggested the NGOs and the churches to see that such laws are being implemented. And that if such laws are found not being implemented or violated, to bring it to the notice of the court. 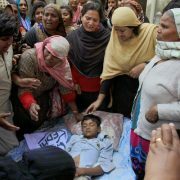 He also shared on how the court takes help from the NGOs to solve marital disputes being brought to Family court, and that this kind of work the NGOs can also do for a child. Islamic scholar, Mr. Ghaffoor Parekh, brought out from the Quran that, working for personal gain, bribery, economic exploitation are sins and are answerable to God. Keeping this context in mind, he brought out the point that poverty is the main cause of child labour in India. Poverty, according to him has kept children away from schools as they have to earn their daily bread. Most importantly, since child labour can’t be stopped due to poverty, he came up with the suggestion of giving jobs to children with fair wages along with education. The third speaker of the day was Prof. Vikas Jambhulkar, from Deptt. of Political Science, Nagpur University. Dr. Jambhulkar spoke on Child rights from Buddhist perspective. He started off by locating children in Buddhism. According to him, Buddhism basically doesn’t speak of a child nor does it deify the child. But it sees childhood as in a process of attaining Buddha. So in this sense it identifies a child as “an independent persona” to attain rights as well. He pointed out that though Buddhism is a monastic religion it is not against family. But it preaches that, an adult doesn’t have right to procreate unless they can provide for children. In interdependence to attain Buddha, a child is seen as a career of values and culture. For self realisation of a child, however it is encouraged not to constrain a child but to expose him/her to other values and culture and allow him/her to choose. This according to him, tells us that Buddha saw children as the biggest wealth and their possibility of getting enlightened was acknowledged. The fourth speaker was Mrs. Parvati Joseph, school co-ordinator, St. Ursula School. She spoke from the Biblical Perspective. She drew out the comparison of the killing of the innocents by King Herod as found in Mathew 2: 1-23 with the present context. King Herod was an ambitious, vicious, heartless “madman”. He killed innocent children in his quest to kill Baby Jesus. She stressed on the fact that this Herod though dead, still exists in our society today. Today many children’s lives are under threat of sickness, death, abuse etc. Therefore, we need to act and intervene. For that she encouraged that adults should be sensitive to children and to have a heart for them. She drove home this point through instances from her life experiences with children in slum and red light areas. She also stated that care, compassion and love can transform even street children. The last speaker of the day was Professor J.T. Thakare. He spoke from the Bahai faith perspective. According to him, the problem of child labour and child right was a common problem of all faiths. And so if we look from sectarian perspective alone, we cannot solve the problem. 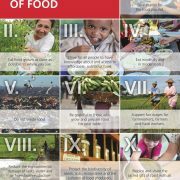 However, we can draw from various symbolisms, parallelism, parables from various religions on childhood. He stresses therefore on the “fundamental unity of religions” as to solving this problem. Summing up the discussion Chairman Dr. Rayalu, opined that the problem of child labour is connected with our socio-economic structure. Unless there is overall development that touches each and every section of the society, problems like child labour can’t be solved. Only when the state takes care of basic amenities like Health and Education can we imagine a society free of child labour he concluded. At the beginning of the programme, Ms. Sweety Helen, the Youth Executive Secretary of NCCI said a prayer for the welfare of all the children of the world. Rev. Samuel Logan presented the vote of thanks. 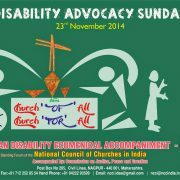 DISABILITY ADVOCACY SUNDAY - 2014.